You knew that slow cookers make delicious soups and stews, but did you know that they also make soft and chewy cookies, gooey bars, fluffy cakes, and moist breads? The beloved Fix-It and Forget-It series has sold nearly eleven million copies, giving home cooks around the world exactly what they craverecipes for delicious, satisfying meals that anyone can make with simple ingredients and minimal preparation time. Now, New York Timesbestselling author Phyllis Good presents a collection that gives cooks an unexpected treatfabulous baked goods! Featuring 150 new, mouthwatering recipesall carefully testedthis will be the go-to book for bake sales, last-minute guests, holiday baking, and everyday treats! 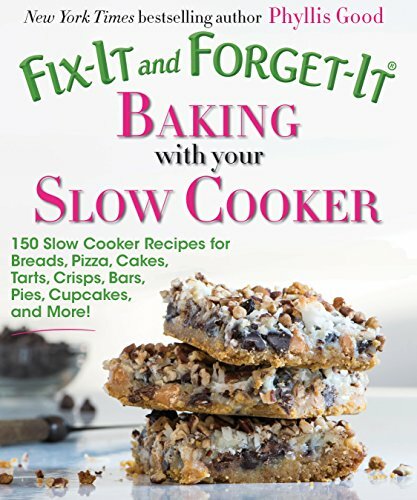 Fix-It and Forget-It Baking with Your Slow Cooker is a big, full-color, useful cookbook that, in addition to recipes, offers tips and tricks for baking with your slow cooker, FAQs, suggestions for substituting common allergen ingredients, and more.